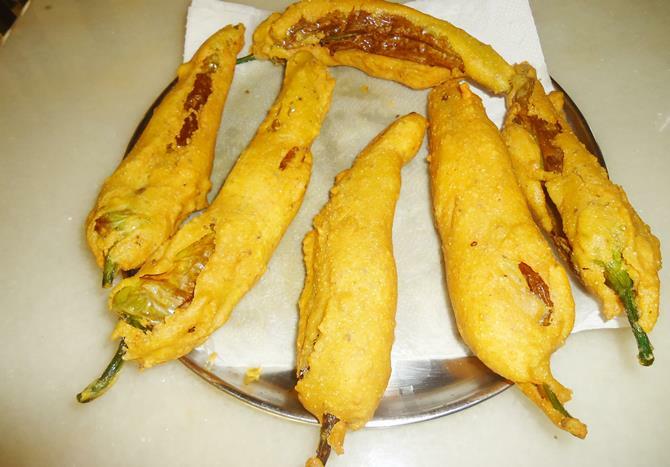 Mirchi bajji also called as mirapakaya bajji in telugu, milagai bajji in tamil or chilli bajji is a popular street food of South India. 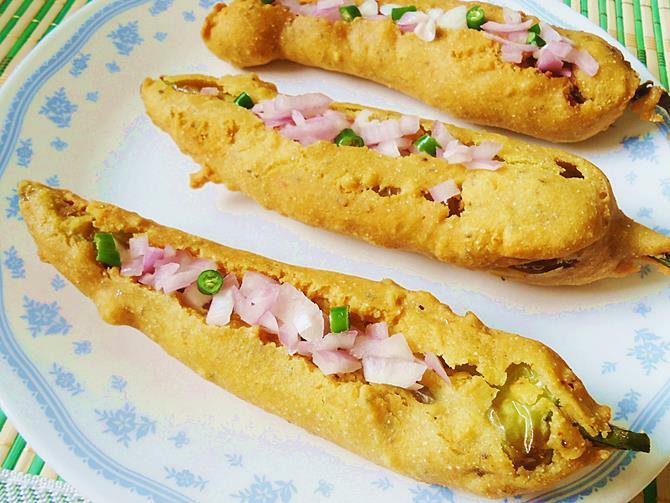 Bajji are a kind of deep fried fritters and are often made at home to have it as a tea time snack especially during the monsoons or winters. 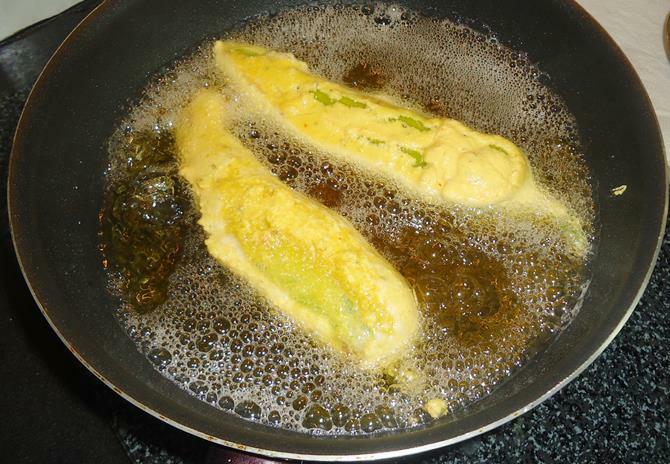 To make mirchi bajji, green chilies are dipped in gram flour batter and crisp fried to perfection. In north Karnataka region, these are served with puffed rice upma called as mandakki oggarne also called as borugula upma in andhra. 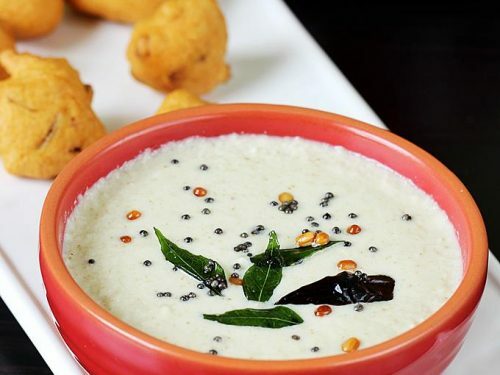 Apart from the mirchi bajji, Bread pakora, Raw banana bajji, aloo/ Potato bajji, Crispy onion pakoda, punugulu, vada, masala vada or mixed dal vada are some of the other popular south Indian street foods. 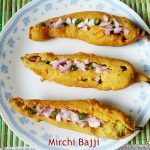 Mirchi bajji recipe – Andhra style mirapakaya bajji are a popular street food made by batter frying the green chilies and then stuffing them with fresh cut onions & lemon juice mixture. 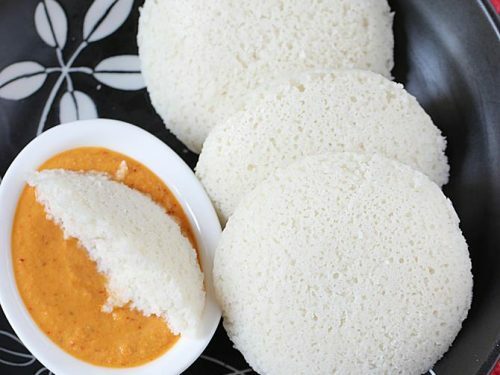 These are served as a snack or as a side with a meal. Make sure you use less spicy chilies. Wash the chilies. Wipe dry with a clean cloth or kitchen tissues. Slit them in the center length wise, deseed and set aside. If any seeds are left inside they may burst in oil. 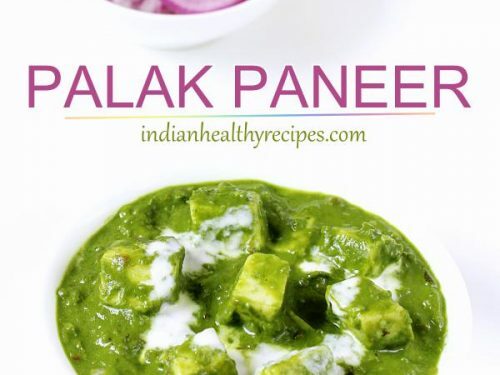 Mix flour, salt, soda, turmeric, red chili powder, ginger garlic paste & ajwain thoroughly in a bowl. Pour water little by little to get the right consistency, not thin and not too thick. The batter should just coat the chili when it is dunked in the batter. Too thin batter will begin to drip off from the chilies .Too thick will not cling on to the chilies. Once you finish mixing, just whisk 4 to 5 times with a fork on a medium speed. Check if the oil is hot enough by dropping a small portion of the batter to the hot oil. If it is ready, the batter will rise immediately without browning. Reduce the flame to medium. Dip the chilies completely in the batter and sweep off the batter with the edge of the bowl on the side where the chili has been slit. So the slit part does not have any batter on it but the cut will be sealed with batter lightly. or You can also coat it completely and fry. Drop it in hot oil. Fry till they turn golden and crisp. Transfer them on to a kitchen tissue. Optional step for extra crispness – Once you finish frying all, revert them back to the hot oil. Fry them again for 1 to 2 mins, to keep them crispy for longer time. 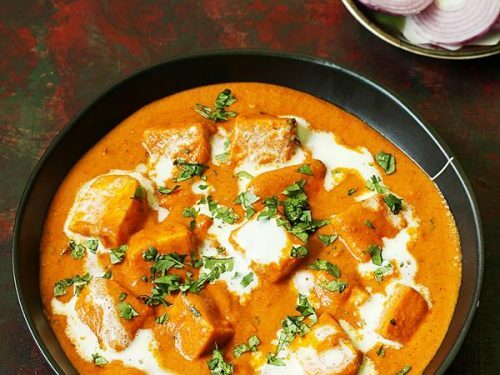 Mix together onions, chilies, red chilli powder (optional) and coriander leaves. Sprinkle some lemon juice. Mix all of them. 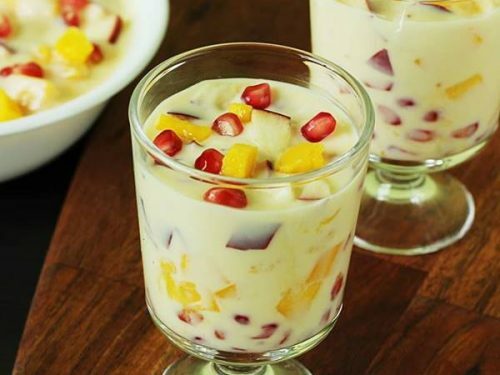 Take a small spoon or knife and open up the slit gently. Stuff all of them as desired with the onion & chilies. Serve mirchi bajji immediately with a cup of tea. 1. Wash chilies and make a slit and remove the seeds. 2. 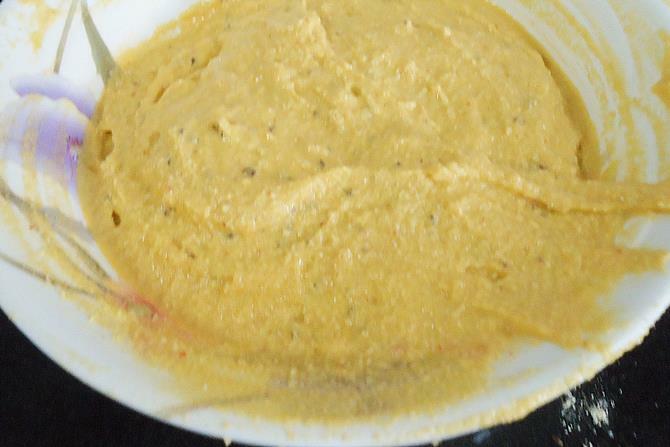 Add besan, corn flour, salt, ginger garlic paste, turmeric, ajwain, red chili powder and soda to a wide bowl. 3. Make a batter adding just enough water to make a neither too thick nor too thin batter. Whisk it gently 4 to 5 times for the soda to act well. Do not over do. 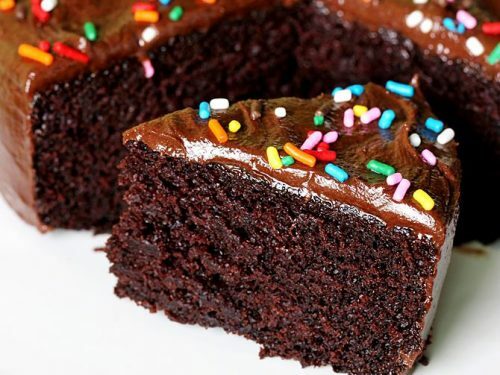 After you beat the batter, you can add more water if needed and bring it to the correct consistency. 4. Heat oil in a deep pan for deep frying, Check if the oil is hot enough by dropping little batter in the oil, it floats if the oil is hot enough. Dip the green chili and sweep off the excess batter and add to the hot oil.For more instructions refer the recipe card below. 5. Fry till golden. If needed you can refry them to keep them crunchy for longer. 6. 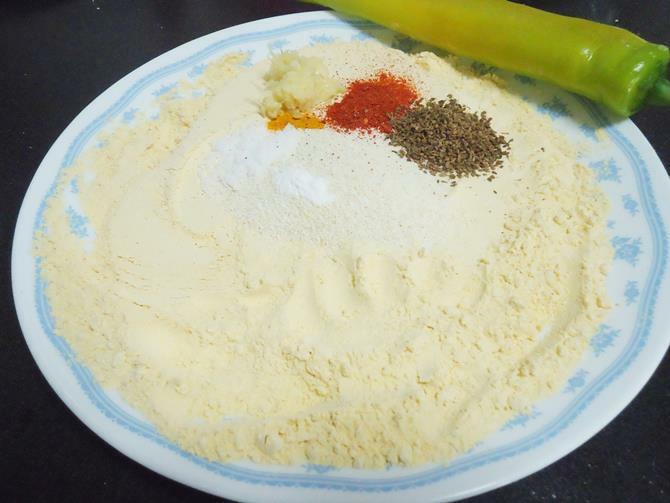 Mix the stuffing ingredients and stuff the mirchi bajjis. Serve mirchi bajji hot. Hi bajji came out looking good but chilli wasn’t cooked properly it was raw. But besan layer was crispy .what should i do? I think they need to be cooked for a little longer on a medium flame. Just refry them now on a medium flame. I guess the flame was a bit too high or the oil not enough hot so it didn’t cook inside. Next time when you make fry them on a medium flame. 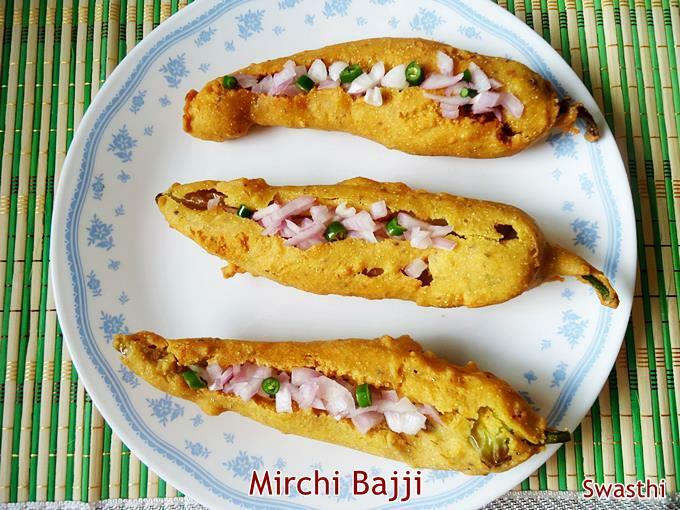 Hi, Swathi I tried your Mirchi bajji it came out well…. Super. 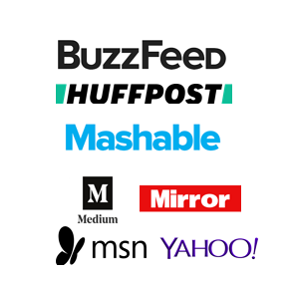 Thanks for your recpies.